Recently there is a new google service:Blogger Play. 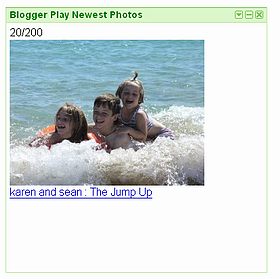 We can see the newest photos in Blogger.com uploaded by the blogger. It's interesting to see what photos uploaded by other users right now. If you want to see these photos and to do something at the same time, you can use this Gadget version below: Push the "+Google" button to add to your iGoogle page. Press this to preview the gadget.